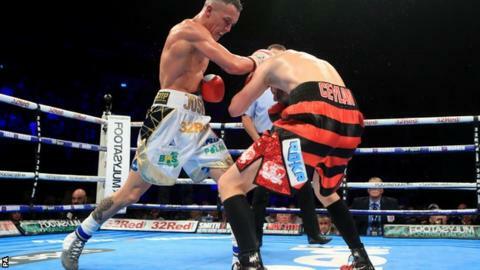 Britain's Josh Warrington set up a world title shot against Wales' IBF featherweight world champion Lee Selby with victory over Dennis Ceylan. Fighting in his home city of Leeds, Warrington knocked down Denmark's Ceylan, 28, with a right hand in the 10th round at the First Direct Arena. Ceylan beat the first count but was knocked him down again before the referee stopped the fight. "I want to get the Welshman up here," Warrington, 26, told BT Sport. Warrington produced a late flurry of punches in each round to move well ahead on the scorecards, before wrapping up victory when Ceylan tired. He is now the mandatory challenger for Selby's IBF belt.